We had a backup fail this week with an error stating something to the lines of Exchange Writer is in a failed state. 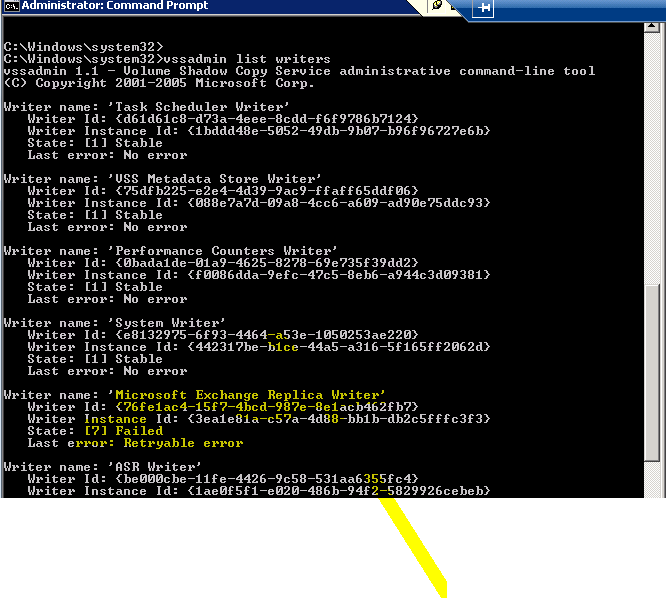 In the command prompt type: vssadmin list writers and hit enter. You will now see a list of all the writers with their current state. The picture below shows the writer in the failed state. I then re-ran vssadmin list writers in the command prompt and it showed its state as stable and the backups went through. During my lab testing and installing Exchange Server 2010 on Windows Server 2008 R2 I keep receiving this pre-requisite that fails. The start mode for the Net. TCP Port Sharing service must be set to Automatic before Setup can continue. Open Power Shell on the Windows 2008 R2 Server that you are trying to install Exchange 2010. Run the Exchange installation wizard again and you should be good to go. A good idea is to run the cmdlts on each of the Exchange server roles before you start installing Exchange 2010 as per this Microsoft article. We had quite a mind twister yesterday with a user that was unable to access his mailbox using his Outlook client nor Outlook WebApp. We have a 3rd party company migrating the users to our Exchange systems. This means that some duplicate accounts are being migrated to our Active Directory environment. The duplicate accounts obviously started confusing people and some tech’s deleted wrong accounts and mailboxes etc. Overall it got quite messy a few times. A lot of “decryption of information” is done by the time the incidents reaches my team. This particular problem was quite interesting because we asked the desktop engineer to access Outlook WebApp to test if he is able to access the mailbox in question. The error received stated that the user account is disabled. We checked and double checked, heck even triple checked but that account was not disabled and the user is supposed to be able to access his mailbox. We verified permissions on the mailbox itself but the user just could not connect to his mailbox. The user was able to logon to Active Directory and use all his other services but just not his mailbox. I then found that there was a disconnected mailbox for the user in Exchange 2010. The disconnected mailbox then just disappeared without telling Exchange to delete the disconnected mailbox. Some research showed that the above command actually refreshes the information from Active Directory. The user was able to connect to his mailbox using Outlook and OutlookWebapp after running this cmdlet. Before looking in all the wrong places run that first cmdlet to “refresh” the information from Active Directory and test mailbox access again.